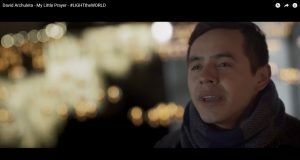 A year ago, David Archuleta created the music video “My Little Prayer #LIGHTtheWORLD.” It has been one of the most viral #LIGHTtheWORLD videos ever—having been viewed 1.3 million times on YouTube and 3.2 million times on Facebook. In a podcast from LDS Perspectives, David explains how this song came to him in a dream. Learn how you can #LIGHTtheWORLD this Christmas. “Something I try to do to each day is begin by saying a prayer in the morning, and then end my day with a prayer at night. Sometimes, however, I fall asleep before I say my nightly prayer. One time almost a year ago I had one of these nights where I fell asleep before saying a prayer. Something unusual happened. “That night I had a dream. It was different than anything I had experiences before. In my dream I was praying-having a conversation with God. The conversation was also different. I was singing. I could hear simple chords in my dream that I was laying a simple melody and prayer on top of.